Please support the Friends of the Longfellow House–Washington’s Headquarters 2012 annual appeal. We are looking ahead to a notable year, and not just because of the events and improvements we have planned. There will be some major change in the National Park Service staff at the site as some employees with long tenure and many fans retire. The Friends group is determined to work with site manager Jim Shea and his staff, both old and new, to provide continuity and maintain as many activities as possible. For that we need our members’ help. Tours of the House, lectures, poetry readings, and concerts are all free to the public. We and the N.P.S. want to keep things that way. In 2011, the Friends devoted the funds from the annual appeal to interior improvements in the House. In particular, we were able to take. 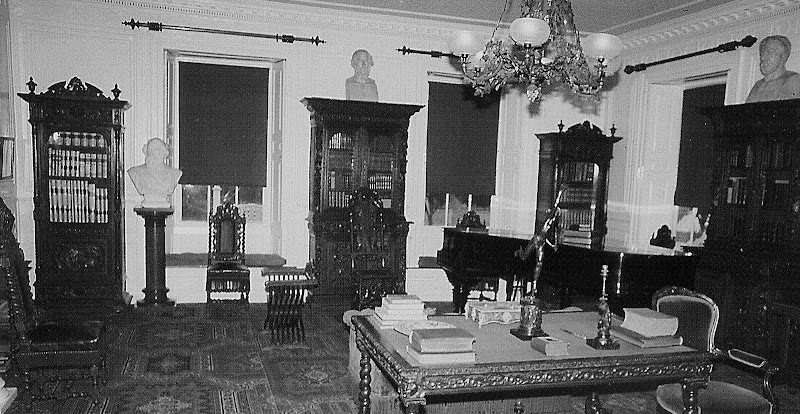 For decades, the largest room in the Longfellows’ house—called the music room or library—has appeared as this picture postcard shows. The curtain rods were bare, exposing the roll-down shades necessary to preserve the artifacts from too much sunlight. Any visitor in the Longfellows’ time would have immediately noticed the lack of window draperies—they were an essential part of any handsome home in the Victorian period. 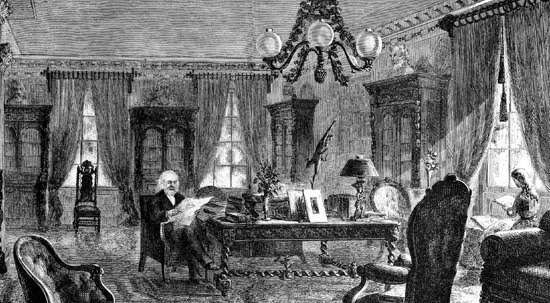 This detail from a commercial engraving published in Henry W. Longfellow’s lifetime shows the effect of the sweeping draperies at each window. The Friends of the Longfellow House has undertaken to pay for appropriate new draperies for all the windows on the ground floor of Longfellow House–Washington’s Headquarters, and for other refurbishing necessary to improve those rooms’ period appearance and enhance the experience of visitors to the House.